Jessica is a former favorite. Now a short form of the name is the spotlight. 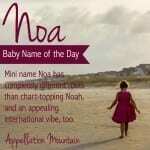 Our Baby Name of the Day is back in the Top 1000 in 2014: Jessa. Shakespeare invented Jessica for The Merchant of Venice. The starting point was probably Yiskah, a minor Old Testament character whose name means “to behold.” Ys, Is, and Js are fluid over the centuries, and Yiskah was spelled Jescah in the Wycliffe Bible, a fourteenth century translation into English that Shakespeare would have known. Merchant was first performed in the 1590s, but Jessica wasn’t popular then. In fact, it was rare in nineteenth and early twentieth century America. Jessie was used, typically as a pet form of Jean, Jane, or another feminine form of John. Then came the 1950s, and Jessica started to rise steadily. Model Jessica Ford was on the pages of Vogue. The Mitford sisters, six aristocratic English women, were making waves – and one of them was named Jessica. London-born actress Jessica Tandy’s career was beginning. By 1960, the name ranked #405, and would climb steadily until Jessica became the #1 name in the US in 1985. No surprise, then, that Jessa rose in the same era, just as Jenna followed Jennifer into wider use. A few dozen girls were given the name in the 1970s and 80s. By the 1990s, when Jessica had been #1 for a while, there were more than 100 Jessas born most years. Often, alternate forms of a name fall along with the original. But Jessa took a different route, thanks to two very different women. First up: Jessa Duggar Seewald. Back in 2004, America was introduced to the mega-family from Arkansas. Jessa is the fifth of nineteen J-named siblings. Love ’em or hate ’em, the family became a sensation, with a long-running TLC series and best-selling books. Jessa featured prominently on the series in 2014, during her engagement and November marriage to Ben Seewald. And then there’s the opposite of the Duggars: HBO’s Girls. Lena Dunham’s critically acclaimed tale of 20-something women in New York includes main character Jessa Johansson. It’s realistic and raw, and Girls’ Jessa gets married, too – but it doesn’t last. The show debuted in 2012, finished up its third season during 2014, and is still going strong. Johansson is played by London-born actress Jemima Kirke. In 2003, as Jessica declined, there were 92 girls given the name. In 2008 the Duggar family graduated from TLC specials to a regular series, and 124 newborns were Jessas. In 2012, Girls debuted, and Jessa was given to 254 girls. The name briefly cracked the Top 1000, at #990. And in 2014, the combination of Girls continued popularity and the hullabaloo around Duggar #5’s wedding day encouraged 323 parents to name their daughters Jessa – pushing the name into the US Top 1000 at #845. This name succeeds for reasons beyond Jessa’s ties to the small screen. The name also benefits from a certain spare, yet feminine, simplicity. In an era with names like Emma and Nora in favor, there’s something about Jessa that fits right in. With roots in the Bible and Shakespeare, it’s easy to imagine parents falling in love with Jessa. What do you think of Jessa? Is this name the next big thing, or will it fade once the Jessas leave the small screen? I know a Jessa! She’s in her thirties and her full name is actually Jessamine. Jessa/Jessamine was an uncommon name when she was growing up, and I believe Jessamine still has not cracked the top 1000. LOVE Jessamine! And Jessamy. And Jessa works so nicely as a nickname. The Duggar association was always going to have a mixed effect on popularity at best, but given the current allegations, it can probably be assumed to be a negative one for most people going forward. Too bad, it’s a cute name. Jinger probably isn’t taking off anytime soon either. I agree that the Duggars were polarising before, but the child abuse revelation and subsequent media backlash aren’t going to do this name any favors. I much prefer Jessamine, then you can use Jessa for short/everyday use. I first heard it in The Sweet Valley High teen books so there definitely us that 80s association there, for better or worse.